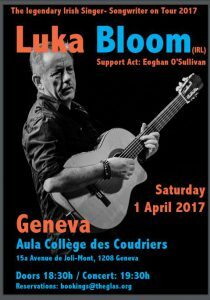 Irish folk legend, Luka Bloom is back in Geneva on Saturday, April 1. It’s four years since GLAS brought him to Geneva for the first time and he is a crowd favourite wherever he goes around the world, thanks to the quality of his songs and his amiable stage presence. Rolling Stone described him as a “A fabulous songwriter, deeply rooted in his homeland and always looking for more.” The Dalai Lama asked him to accompany him on a tour because of the beautiful song he wrote about the Dalai Lama’s flight into exile. The support act will be Vaud-based Irish singer-songwriter Eoghan O’Sullivan. Our branch in Gaza strives incessantly to meet the growing demand for music education as a means to facilitate the access of Gaza’s young people to cultural life. Since 2012, it has been offering the first-ever structured and long-term music education program in Gaza, opening opportunities for children aged 6-18 to learn the joy of music and share it with their community. During the academic year 2015/2016, the number of students enrolled in the branch reached at around 204 (60% of which were girls), compared to 120 in 2012. The Conservatory in Gaza continuously seeks to motivate its students and teachers both academically and professionally through encouraging them to form choirs, groups and ensembles and participate in Palestinian and international musical activities and specialized workshops such as the Palestine National Music Competition and the Palestinian Youth Orchestra tour. Currently the Conservatory’ branch in Gaza manages 4 ensembles, 1 choir and 1 orchestra. It also organizes the “Sea and Freedom” Festival on an annual basis. In 2015 and 2016, 25 concerts were performed offering a myriad of musical genres including Arabic, Classical and modern repertoires. Around 2500 participants attended the concerts with over 150 members who comprised the organizational, musical and technical groups of the festival. “With each successive album, Luka Bloom digs deeper and gazes wider.” The Irish Times.